Working largely in Paris and London, the American artist James McNeill Whistler Whistler forged close relationships with the Impressionists and became known worldwide as a Japonisme artist. It is said that Whistler discovered Japanese prints in a Chinese tearoom near London Bridge. Whistler was profoundly inspired by Japanese art, adopting the Japanese principles of composition and spatial organization in his paintings. 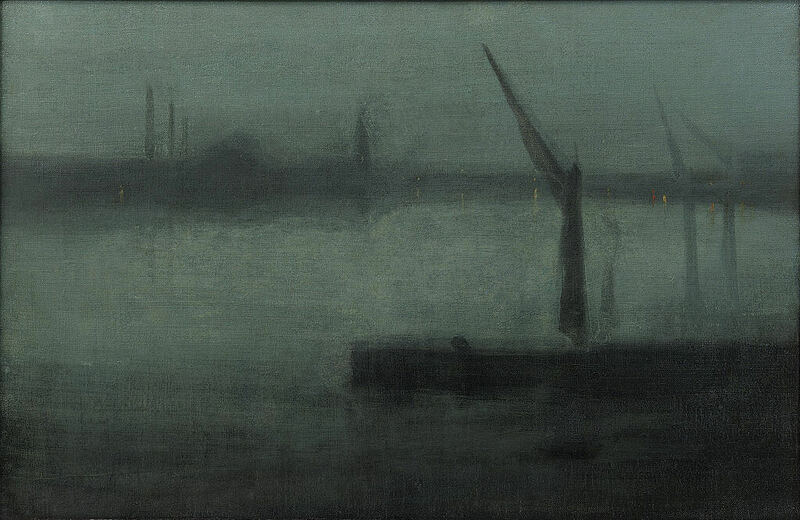 In Whistler’s painting, Nocturne: Blue and Silver—Battersea Reach, shown above, the asymmetrical composition and emphasis on the misty atmospheric effects of early light both reveals the artist’s debt to Japanese art and transforms the urban industrial landscape into a thing of poetic beauty.